The Casio PX-770 combines the slim, modernized design of a digital piano with the sound and feel of a true grand piano. Its elegant, furniture-style cabinet includes a sliding keyboard cover, music stand and – just like a real piano – three built-in pedals (damper, soft and sostenuto). Coupled with its relatively low price tag (can be found for about $700 online), the PX-770 provides a low cost piano playing experience that’s ideal for relative beginners interested in acquiring a digital piano that’s more than function and one they can surely grow with. In this review, I’ll break down what I like and dislike about the Casio PX-770. 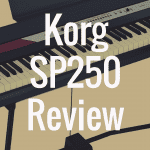 We’ll cover everything from learning how to play piano on the PX-770, to what you can expect from the keys (i.e. how realistic do they feel?) and sound quality. 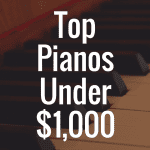 In order to better help you, please view the interactive table below, which will allow you to quickly compare the Casio PX-770 to other noteworthy digital pianos on the market (like the popular Casio PX-870, among others). 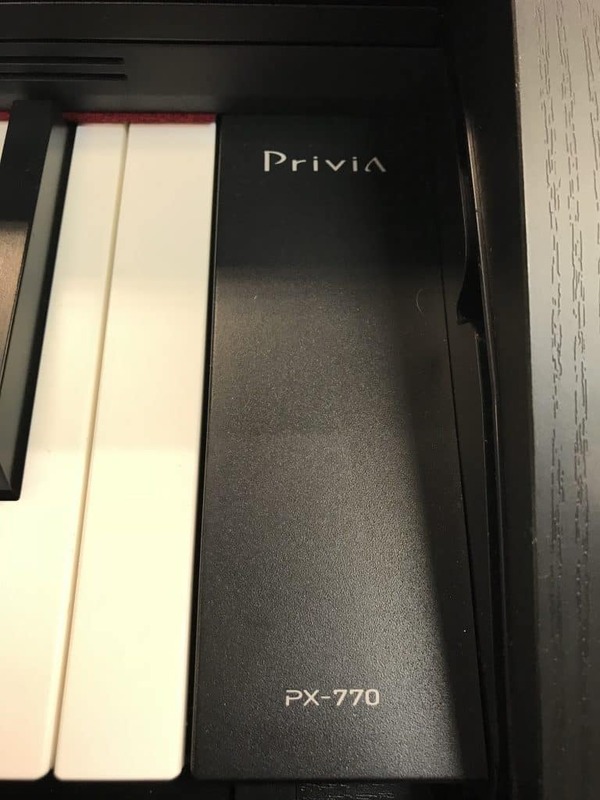 The Casio Privia PX-770 is perhaps one of the best 88-key digital pianos on the market for those interested in a low-cost digital piano. The PX-770 combines realistic feel and touch keys, high-quality sound, multiple upgraded instrument voices and a sleek, lightweight design at an affordable price. From keyboard dabbler to true novice, the Casio PX-770 makes learning to play easy with its unique duet/lesson mode. Perfect for dual playing, the duet mode splits the keyboard into two identical halves with the same exact octave range, mimicking the student-teacher/dual-piano scenario. This feature is of course particularly great if you’re looking for one of the best beginner digital pianos you can buy. The Casio PX-770 also comes with a 60-song built-in playback and/or accompaniment library, and has the capability to customize with room for an additional 10 songs. Perfect for simultaneous play, the PX-770’s 60-song preprogrammed song library has the option to slow-down or speed-up the tempo of each song, allowing players to play along with the music at their own pace. The PX-770 also has the capability to customize the song library, with empty slots for 10 additional songs of the player’s choice. The PX-770 allows players to record and play-back their own performances with its on-board two-track MIDI recorder and optional metronome, as well. The digital piano also has two (2) headphone jacks for quiet playing and playback. 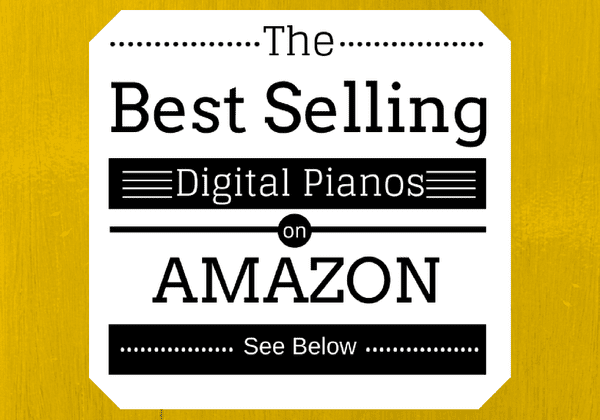 And below, please take a moment to view some of the best-selling digital pianos on Amazon, and see how well they stack up to the PX-770. The PX-770 offers 88 full-size, scaled hammer action keys which are perfectly weighted for true grand piano playing action. The weight and depression of the keys is impeccable to those of a real piano. Given its compact size, the Casio PX-770 perfectly pairs a sleek design with a full-sized 88-key keyboard, providing the player with a very natural, incredibly realistic piano playing experience. Sitting down at the Casio PX-770 digital piano felt as close to sitting down at an acoustic piano as I have ever experienced. When it comes to real-feel play, the PX-770 couldn’t get much closer to the actual thing. 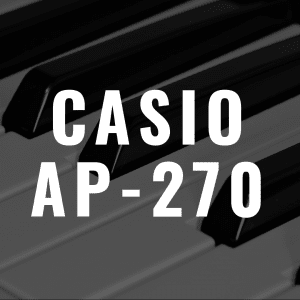 From the 88-key span and touch-sensitive, scaled hammer-action keys to the Acoustic and Intelligent Resonator (AiR) processor, Casio certainly won’t disappoint any fans that favorsd the previous model—the PX-760. Much like that of its predecessor, the aforementioned Casio PX-760, the newer PX-770 features Tri-Sensor II Scaled Hammer Action piano keys for realistic key-action. The weighed keys depress and respond just like those of a concert-style piano. Each key is touch-sensitive, so players can increase the weight of their touch for a louder, bolder fortissimo sound, or decrease the weight of their touch for a gentler, softer pianissimo sound. The weight and touch sensitivity of the scaled hammer-action keys is uncanny. I’m in no way going to suggest that the PX-770 is akin to playing on a highly expensive acoustic piano, but I will say that, given the significant difference in cost between the PX-770 and an acoustic piano, it’s quite amazing how close the keys can feel to the real thing. 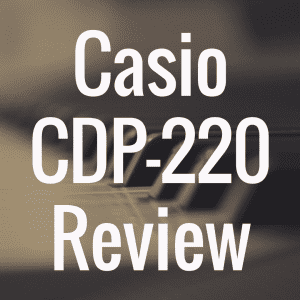 Despite the Casio PX-770 being an excellent imitator of a real acoustic piano, it ultimately is a digital keyboard, and stays true to those features, as well, including its varying degrees of touch sensitivity. Touch sensitivity can easily be adjusted to one of three preset levels. The first setting is the least sensitive to touch, and there is very little difference when the player plays with a heavy hand or a light touch. The second level of touch sensitivity has a slighter wider sensitivity to the players’ touch. Whereas the first level makes very little sound adjustment based upon the weight of the players’ fingers, the second level is slightly more sensitive to finger weight. In comparison, the third level of touch-sensitivity gives players the most widely dynamic range of touch-sensitivity. The lightest touch will deliver a delicate pianissimo sound, whereas the heaviest touch will deliver the boldest fortissimo. It should be noted that touch-sensitivity can also be turned off, if desired. 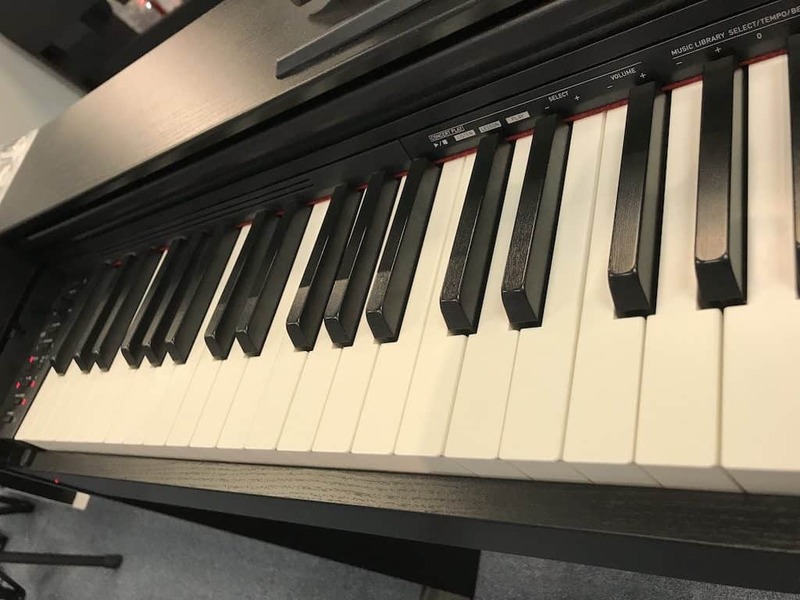 When touch-sensitivity is inactive, the digital piano will play the same volume tone for each time the keys are depressed, regardless of the players’ touch. With that said, Casio’s attempt to replicate the feel of an acoustic piano continues, as the PX-770 features texturized keys. 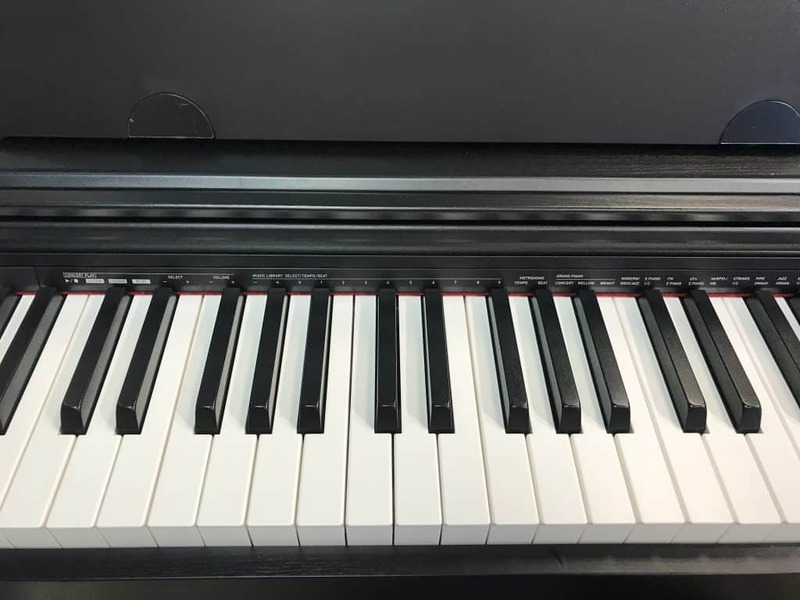 Since manufacturing the older PX-760 model, Casio has reformulated their synthetic ivory and ebony materials used to give the piano a more natural, realistic, texturized keytop surface. Like the PX-760, the newer model PX-770 has slightly textured keytops, but the new materials and improved texturizing allows for PX-770 players to have a even more realistic, natural experience. Although texturized keys do give the Casio PX-770 an advantage over other makes and models in terms of the real-feel play experience, I did not find their texturizing to be spot on to that of an acoustic piano. Ivory is typically smooth, and these keys are not. 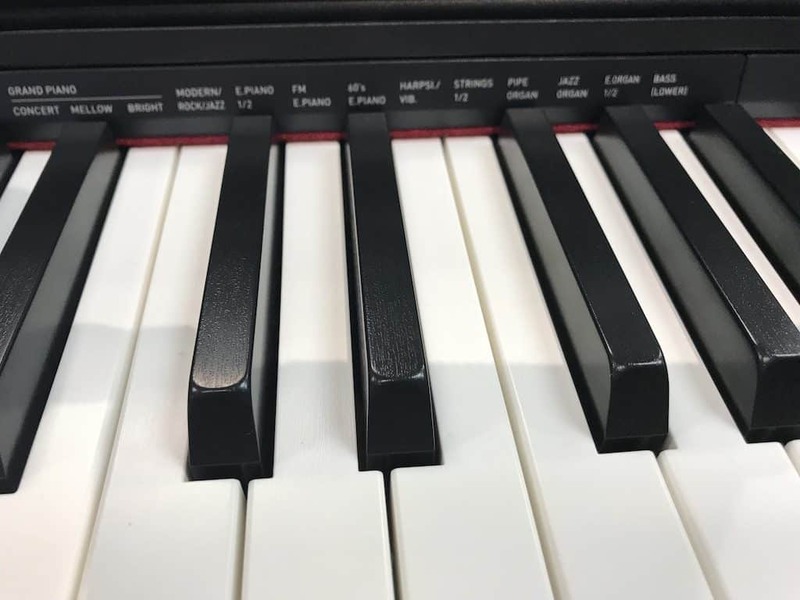 But there is a definite advantage to the texturized keys – they make it easier for the player’s hands to stay firmly planted on top of the keys. With textured keys, you don’t have to worry that your fingers will slip off while playing. With more resonance reproduction and natural note decay, the PX-770’s tone is significantly better and more realistic than that of its older brother, the PX-760, as well. Resonance reproduction is the digital reproduction of an acoustic piano’s strings and the way that the sound waves from the strings of a piano are amplified based on each strings’ resonance quality, or natural frequencies of vibration. Note decay is the natural length of a note played on an acoustic instrument until it fades out to silence. The now left-oriented piano control buttons provide less clutter and more piano realism on the 770. 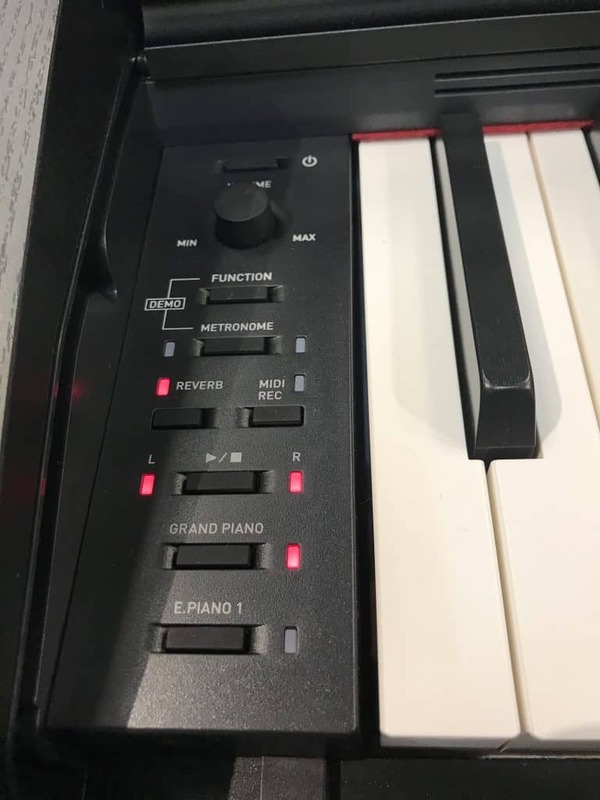 There are dedicated buttons for functions, including MIDI Recorder, Reverb and Metronome, two main instrument voice buttons (one each for the Grand Piano and E. Piano 1 voices), a Play/Stop button, and a volume dial. In order to use of most of the settings and functions, players must hold down the “Function” button while depressing other button combinations. This is a little inconvenient, and somewhat confusing. Since there is no digital display, the players has to count how many times they press a button while holding down the “Function” button in order to scroll through to the desired effect or instrument. Each time a setting is changed, the unit will “beep” anywhere from one to four times, indicating the selection made by the user. All button combinations for the wide range of functions available on the PX-770 are printed in the included Owner’s Manual. Unlike the newer PX-870, the PX-770 does not include a Hall Simulator function. The Hall Simulator function is more of an expensive “bell and whistle” than a necessary function of a digital piano. It is extraneous, and more of a convenience than anything else, so the PX-770 not including this more expensive feature is really no major loss to the player, in my opinion. However, if a player truly wants to recreate the sound of playing in a large music hall, they can easily achieve that effect by finding the right combination of chorus and reverb effects by ear. With Casio’s larger capacity Acoustic and Intelligent Resonator (AiR) processor onboard, the PX-770 offers the most true piano sound through the most advanced technology, making it hands-down one of the best sounding digital pianos available today. Two 8-Watt speakers provide powerful sound, for a heightened playing and listening experience. The PX-770’s five grand piano voices really capture and encompass the richness and slightly different sounds and tones of different acoustic grand pianos. From my personal experience playing a multitude of different makes of grand and baby grand pianos, the Casio PX-770 does an excellent job recreating the different tone quality, resonance and note decay of five different grand pianos. With its 19 instrument sounds, 18 built-in tones with split and layer functions, 128-note polyphony and 8 onboard reverb/chorus effects, the PX-770 is better than its competition (well, based on price, at least), boasting the most realistic sounding compilation of instrument voices to add diversity, expression and feeling to your music. The PX-770’s Grand Piano voice has also been upgraded, and uses four different levels of stereo-recorded samples of a real brand piano to deliver the most realistic, most dynamic sound available on a unit in this price range. The Casio Privia PX-770 makes connecting to any device easy. Via its on-board class-compliant USB port, you can easily connect to your Mac, PC, iOS or Android device, allowing you to store your authentic recordings on your compatible device. Another great convenience of the PX-770’s connectivity is that no driver downloads are required. The upgraded cabinet design has a beautiful wooden texture, which is available in three colors: black, brown and white. Given its color finishes, it would be a beautiful addition to any home. The cabinet is incredibly easy to assemble, as the only tool required for assembly is a Phillips head screwdriver. However, a two-person assembly would be ideal, so as not to drop the digital keyboard unit when attaching it to its base. The piano is 54.7 inches wide, 31.4 inches tall, and a surprisingly slim 11.7 inches deep, so it is highly adaptable to smaller spaces. The PX-770 is also incredibly light, weighing in at only 69.4 lbs fully assembled, and can easily be moved around by two people. 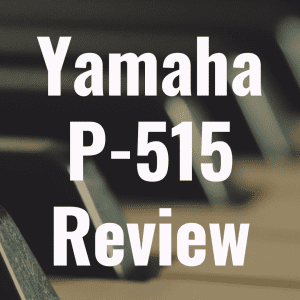 Although it is a lightweight, somewhat compact unit, moving the digital piano around too much could cause damage, and this device is not recommended as a portable keyboard. Like all delicate instruments, the PX-770 should be moved with the utmost care to ensure its longevity and high-quality sound and performance. In comparison to the older Casio PX-760, the difference between it and the PX-770 are actually quite small. However, the upgrades that Casio has made to the PX-770 are certainly important, making the newer model the one you should definitely target of the two (unless there’s an opportunity for you to get the PX-760 at significantly lower price). First, an improved sound chip onboard the PX-770 provides a more natural sound resonance, and longer right-pedal sustain times. Next, all 19 instrument voices have been upgraded, and there is now one additional acoustic piano sound. The upgraded cabinet construction, with fewer seams and sleeker built-in speakers, give the PX-770 a really appealing look, as well. Certainly this is a digital piano that you’re buying for the touch, feel, and sound first and foremost. But it’s comforting to know that you can place this piano in your living room or bedroom and know that it won’t be an eyesore. The cabinet is also much more lightweight than the latest of the Casio Privia series, the PX-870, which has a solid, heavier, enclosed cabinet. One of the best features of the Casio PX-770 is its price-tag. The number of features, voices and accompaniments offered by the PX-770 for the cost is unbeatable. 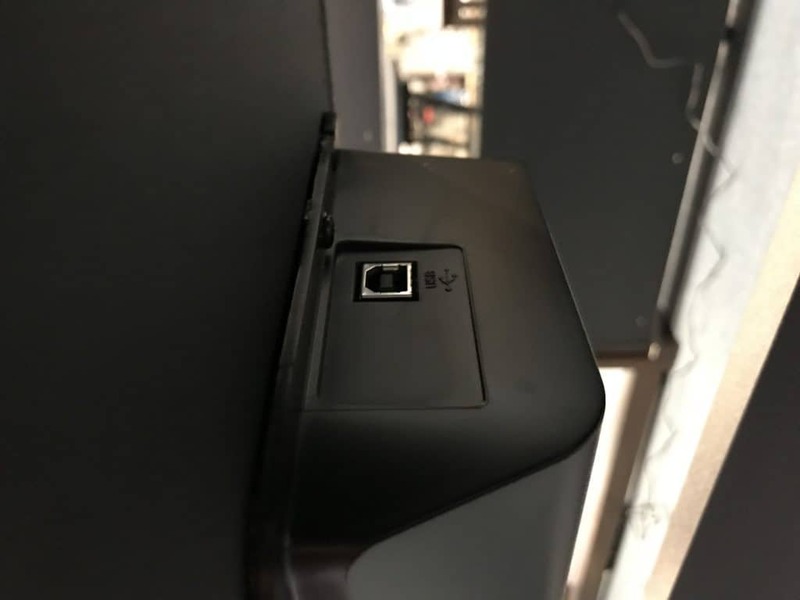 However, the PX-770 does not come with a piano bench, so you will have to purchase one independently to truly recreate the acoustic piano experience. The Casio PX-770 is a really nice, quality digital piano at an affordable price. If money is a factor, you’ll probably want to consider the Casio PX-770 (approximately $700) as your next big instrument purchase. 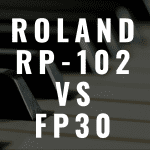 Roland RP-102 vs Roland FP-30: Which Piano is the Best?